For the first time, astronomers have found direct evidence of a phenomenon long thought to play an important role in the formation of giant galaxies: the ongoing disruption of a small galaxy as it orbits within the dark matter halo of a much larger galaxy. Images from the Hubble Space Telescope, confirmed by detailed observations at the W. M. Keck Observatory in Hawaii, show a dwarf satellite galaxy in the process of being torn apart by gravitational forces due to the larger spiral galaxy and its halo of dark matter. "Although long predicted, direct evidence for plumes of stars being ripped from a dwarf galaxy as it is swallowed up by a giant galaxy has remained elusive. This discovery provides the best evidence to date," said Duncan Forbes, an astronomer at Swinburne University of Technology in Australia. Forbes is first author of a report on the discovery published online by Science Express on August 7. The paper will appear in print in a later issue of the journal Science. Forbes's coauthors include Jean Brodie, professor of astronomy and astrophysics at the University of California, Santa Cruz, whose team examined the two galaxies during an observing run at the powerful Keck I Telescope in March. "In the Hubble images you can see a small blob close to the spiral galaxy that seems to have two plumes coming from it, so you could speculate that they are connected. But to prove it we had to show that they are in fact in the same location in space and not just superimposed," Brodie said. 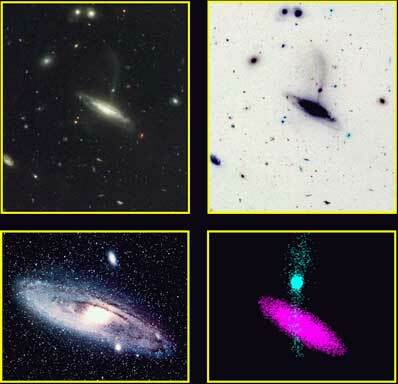 Spectroscopic analysis of the light from the two galaxies showed that they are in fact physically associated, lying at a distance of about 2 billion light-years from Earth. Because the dwarf galaxy is so faint, this type of analysis could only be achieved with a large telescope like the Keck, Brodie said. The two interacting galaxies are among thousands of faint galaxies seen in the background of one of the first images obtained with the new Advanced Camera for Surveys installed on the Hubble Space Telescope last year. Dominating the image is the dramatic "Tadpole" galaxy, but it was the backdrop of more distant galaxies that most excited astronomers. Michael Beasley, a postdoctoral researcher working with Forbes at Swinburne, first noted the uncataloged spiral galaxy and its apparent satellite. Beasley, Brodie, and Brodie's graduate student Jay Strader were at the Keck I Telescope as part of an ongoing study of globular clusters in distant galaxies when they decided to take a closer look at this intriguing pair of objects. Plumes of stars can be seen streaming away from the center of the dwarf galaxy. The gravitational pull of the larger spiral galaxy and its associated dark matter creates tidal forces that disrupt the smaller galaxy and strip stars away from it. These stars eventually become part of the spherical halo of stars around the flattened disk of the spiral galaxy. With the observational data in hand, the researchers turned to Kenji Bekki of the University of New South Wales, who performed computer simulations to see how the interaction of the two galaxies would evolve over time. The simulations suggest that the disruption process is transforming the satellite from one type of dwarf galaxy into another, Forbes said. "Our observations combined with our simulations lend support to the idea of tidal disruption transforming dwarf galaxies," he said. The new findings support the prevailing theory of a hierarchical universe in which galaxies were formed within halos of dark matter, and massive galaxies have grown by gobbling up smaller galaxies. Astronomers have observed many cases of galaxy interactions involving two large galaxies, but the evidence for giant galaxies absorbing less massive ones has been largely circumstantial. For example, streams of stars in our own Milky Way and in the nearby Andromeda galaxy have been identified as relics of past mergers. "We assume that mergers with minor galaxies are a very important part of how massive galaxies build up their halos, but this is the first time we've been able to see directly that it's happening, without making any assumptions," Brodie said. Simulations of dwarf satellites suggest why astronomers have not previously witnessed such a clear example of ongoing disruption. Most dwarf galaxies have highly elongated orbits that take them far away from their host galaxies most of the time. In addition, the plumes or tails of stars being stripped away from them are usually very faint and extremely hard to detect. "You can only see this type of interaction when the satellite galaxy is very close to the more massive host galaxy, but dwarf galaxies spend most of their time very far away," Brodie said.